Feedback: 86 comments - leave yours! I know a lot about Chinese tea but very little about Japanese tea. How many times did the Japanese borrow an idea from their continental neighors and turn it into perfection? 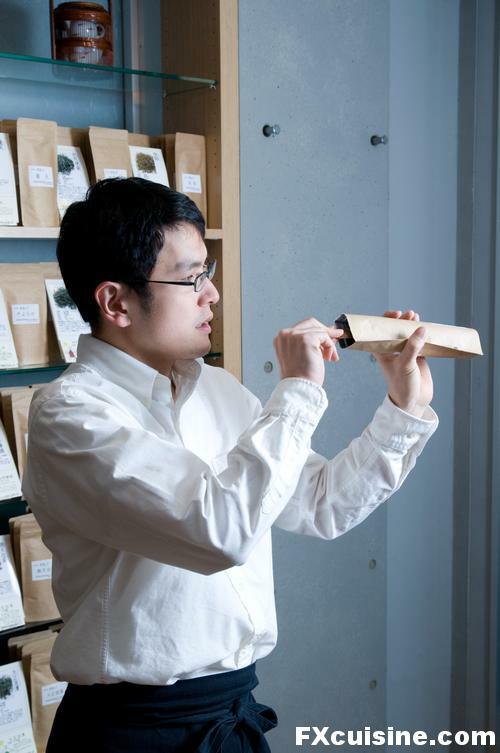 That's what I wanted to find out - could high class Japanese tea taste even better than top Chinese Oolongs or Pu-Erh? Paul and Junko, two of my precious little Japanese friends, recommended I visit Cha Cha Noma in Tokyo for an introduction in high quality Japanese gourmet tea. We were welcomed by one of the youthful tea waiters who showed us a long list of Japanese green teas, each adorned with a multidimensional graph to gauge its taste on various dimensions. I ordered iced green tea, expecting to receive some tall glass like in Japanese fast food joints. Instead the tea waiter starts his dance, warming the cup, then pouring a handful of delicate, brittle tea leaves in a zhong. We are way beyond Lipton here, with the minuscule tea leaves steeped in a minuscule amount of hot water before being covered in ice cubes. The result is intensely bitter with a highly complex leafy taste. A really interesting taste although it would have benefitted from a little sugar in my eyes. But pull out a bag of sugar in a fine tea shop in Japan or China and you'll end up in the wontons just like if you had put ice cubes in a glass of Bordeaux in France. Proper tea is done in petite cups and pots. Washing them in hot water is essential in controlling the temperature, but these guys take it to a whole new level - what's Japanese for tea juggling? I discover that the second green tea I ordered is served by the teaspoon - literally. The tea waiter places the tea leaves in a small saucer, then wets the leaves with a trickle of water and serves you about 2 teaspoons worth of tea in a small glass. Amazing tea, for sure, but not the one to order if thirst-quenching is a priority. But I'll admit that among all the things I've done for you guys, my beloved readers, this was a refreshing break from the more caloricious episodes. For the more adventurous, the shop provides a Japanese pickled tea that will bring you back from the dead 10 times out of 10. But as soon as you swallow, you'll wish you stayed dead. Similar to Burmese Lahpet, with a touch of that elusive smell of sauerkraut you'd have forgotten all summer long in the rear of your car. ... then steeps the leaves for a few seconds to cleanse them, then steeps them again, by which time yours truly is increasingly looking at his watch and moving, inches by inches, towards the exit. But they catch me before I escape and finally, under the pleasantly distant gaze of the shopping attendants, I took a sip. Vinegary, but not overly unpleasant. Might work fine with a salama da sugo perhaps. I very much recommend a visit to this shop, located in a nondesript building close to a rather posh shopping area in Tokyo. The day I visited, the shop seemed to do most of its business with luscious giant green tea ice creams served to hordes of lively Japanese high school girls who did not seem to have come to ponder the intricacies of Maccha tea. Fab pictures as always! I'm impressed by that water pouring, it's been captured really well! I'm not a huge fan of green tea but you've made me want to explore some more! I've got a friend who used to rave about it - and having seen the skill of the pourer I can see why! FX's answer→ Diane, green tea is good only when steeped properly, you need to buy some good one and steep it at 65°C not more. I recommend the Chinese long-leaved green teas, they are just so delicious! Very interesting! Thanks for the great post! This is why I had no other choice but to vote for you. Fabulous post -- you never fail to amaze (and I'm new here!). Btw, you are right. Graukase is definitely note for the faint of heart (or nose) but we couldn't resist bringing some home. Keep up the great posts! FX's answer→ Thanks Rowena, and you would really end up being the next day's special if using sugar in such a place! Graukaese is a really interesting cheese but to be used in moderation just like Schabziger! Exceptional post as always. Thing about Japanese people, is they focus on one aspect, then perfect it. I feel you are truly lucky to have experienced the tea dance. I will make a point to go there when I go to Japan next. FX's answer→ Jason I reallly recommend Japan if you've never been, and if you have then by all means do visit this shop, very fun experience! A soothing breakfast is plain hot rice with hot green tea poured over it (in amounts sauce to soup, your choice). It sounds like an option for the "sauerkraut tea." FX's answer→ Donna I had many a Japanese breakfast, kaiseki-style, in the last couple weeks and not yearning for more right now! But I warmly recommend you try a kaiseki dinner if in Japan, it is very suprising as most of the food is not identifiable neither by sight nor by taste. They really love fish guts and prepare it in highly attractive fashion, as well as dozens of pickles. Beautiful as always! I forwarded the link to several people, tea lovers and photo lovers, pointing out the individual drops of water, amazing. My vote for you was never in question. FX's answer→ Joyce, thank you for your kind words! For a book, do you think the pictures would be sufficient or would I need to reshoot everything from scratch? How many pictures would appear for each article? And how many articles would be included in the book? Very interesting and informative. I love green tea and trying different kinds! FX's answer→ Thank you Eurie! As much as I like your videos, I really prefer your still photography. Maybe we could enjoy both. You have a wonderful site and I look forward to it arriving in my inbox. FX's answer→ Zio Bob, as I am starting with video it is harder for me to get the same results as I do with photo which I've been doing for 2 years now. But my goal is to get the same quality on the videos as I do on the still pictures! Thank you for such a fun article! This may be nit-picking, but "Maccha" or "Matcha" was not actually what you had here. This term is used specifically for the powdered green tea that is used in Tea Ceremony (while this was full of ceremony, this was not actually Tea Ceremony!) and is also used to make other products, like noodles, green. It is also very healthy as you are actually consuming the entire leaf, rather than an infusion. Reportedly, one cup has the same amount of Vitamin C as a bushel of oranges! The flavor is definitely an acquired taste, having most new drinkers compare it to fresh grass clippings. Tea Ceremony and matcha is delicious and beautiful, and quintessentially Japanese. There are hundreds of variations, and even the most basic way will take at least 20 minutes or so to complete. If you would liek to know more, I could go on! I studied Tea Ceremony for 4 years whilst growing up in Japan. What you had here would more appropriately be called "Nihon-cha" - literally "Japanese Tea". FX's answer→ Danielle, thanks a lot for your email, yes absolutely this was not matcha but sencha. Please do let me know if you hear about a book in a Western European language that discusses Japanese tea, I am eager to learn more! Fantastic pictures. I've never witnessed a japanese tea ceremony but have had (and tried to learn to make) the chinese equivalent many time (with a whole set of it's own procedures dependent on type of tea etc. etc.). It's been years since I got my tea set out - this has inspired me. Thanks for posting this! FX's answer→ FP the procedures they used are still quite close to Gong Fu Cha, Taiwan-style, but in the article I showed two really unique steeping procedures. I wonder if the Japanese brought this to Taiwan or borrowed it from the Chinese? FX's answer→ Thank you Thuan! FX's answer→ Thanks Geoff and hold on for more! Thank you for the laughs. The photos are terrific, not only the drops of water but also the water pouring from the black teapot into the glass jug, with all its reflections. Well, just off to make a pot of green Christmas tea from Tekoe. Not quite as exotic but it tastes good. FX's answer→ Thanks Barbara, yes the flowing water came out quite nicely, didn't it? Japanise Green Tea preperation is wonderful. Excellent article and btw- your blog is FAR and away the best compared to those in the running for the best food blog by whoever is making the decisions. Which means you probably won't win! Next time in Japan visit a tea house for the tea ceremony and if they let you take pictures.....Merci once again for a delightful post. FX's answer→ Thanks Theodora, yes those blogs competitions are really not that serious - no hard feelings anyway! How fun. The tea preparation looks like a performance. Love the high-def photos. This experience was quite different from the traditional Japanese tea ceremony I was expecting. FX's answer→ Sterling yes I am allergic to the concept of tea ceremony because everytime I pull out my gong fu cha set there is some boffin who says "Ah, the tea ceremony" whereas it's only about getting the taste out of the leaves and nothing about esthetics and tradition. So I was very glad to see these fine Japanese fellows preparing tea without too much ceremony! Bring on the Kobe beef!...if I were ever to be lucky enough to visit Japan, a high-end steakhouse would be the first stop on the journey. You're just teasing us, aren't you? As always, good stuff. New camera for the pics, or just a different resolution? FX's answer→ Ouroboros I did indeed have Kobe beef several times but the pictures are just OK so they wouldn't make for a nice article! Same camera, same resolution, just more pictures in portrait aspect so they are taller on the screen and more pixels. I enjoyed your (as usual) intersting & well produced article. FX's answer→ Michael, you could very well say that. In fact tea has been brought to India by the British in the late 19th century to find an alternative growing place more amenable to their goals than China. Then they had demonstrators visit Indian villages to show them this new product. The Indians adopted tea but with their own twist, hopelessly oversteeped and with loads of spices and milk. Quite delicious but very far from the delights of high class Chinese or Japanese tea. FX's answer→ Joel next time I'll smuggle in a little sugar to sweeten the brew. Unfortunately I am a "super taster" for some bitter molecules and they hurt extra! What kinda settings do you use on your camera to get that pouring water effect? it is so clear? do you use multi shot? FX's answer→ I use flash through an umbrella at 45° angle and camera in Manual. FX's answer→ Macha, thank you for those details! Unfortunately I have never found a serious book about Japanese tea which I could actually read, and never found a Japanese who knew a lot about tea and the English language. Still much to learn for me! I find Iron Goddess to be like a very subtle and well-blended perfume. Here is a desription if you like (based on a perfumer's analogy): The first steeping results in top notes of fresh green and bitter leafiness with a thick vanilla undertone. The middle notes, after several quick steepings (as these are steeped in very little water and drunk quickly in the traditional manner) consist of strong but not cloying sweet gardenias and a subtler green, and the base notes, if you continue steeping for a total of nine or ten times, mellows into a very soft and subtle pear fruit with whiffs of vanilla and a complimentary mellow green. If you are interested in a packet, I would gladly send it to you in Switzerland. And although you would not have the traditional equipment you can use any small cup with a ready supply of hot water. FX's answer→ Thanks Sara, in fact I have nearly a hundred Chinese and Taiwanese Oolongs and have been a fan for very long. I have several gong fu cha sets with tea boats, pots and the like. Thanks for the offer anyway. Just didn't find a way to take visually attractive pictures for an article - yet! FX, What beautiful photographs...Thanks again for a wonderful photo essay. FX's answer→ Luci, glad you liked them! Although it is Japanese green tea, the tea kit set and the way to make tea are totally Chinese. Japanese don't really make tea in this way. FX's answer→ Joseph, I think the Japanese move in mysterious ways, at least to me, and they might prepare tea in more ways than one. 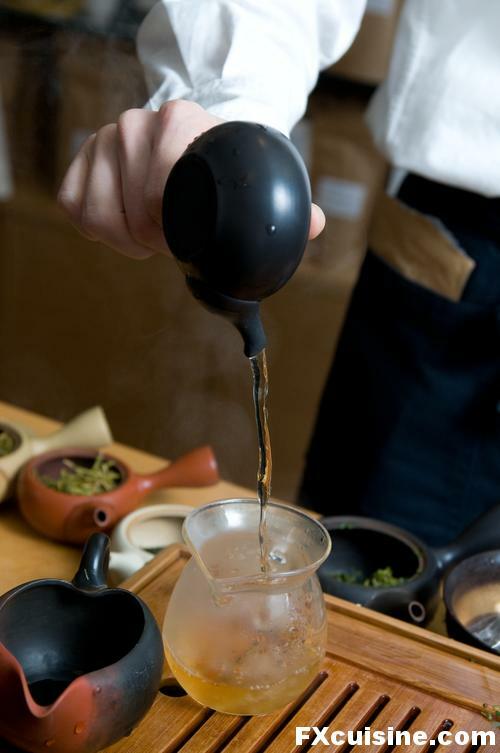 Find me an English speaking Japanese tea guru and we'll know for sure! Wow! Your photos leave my breathless! That was some performance! FX's answer→ Thanks foodista, yes the lighting came out nicely I must say, although the background leaves me thinking at how I could have made the subject stand out even more. The other tea waiter looked more baroque with a little beard, but didn't speak any English. That's exactly what I thought. (@49) Not the way we serve at our homes, anyway. Born Japanese and raised by a tea ceremony instructor I have never seen anything like it, neither in form nor philosophy. I think the owner is purposefully defying tradition: why not -- if it's entertaining and serves good tea. FX's answer→ Sets, I found many books about the tea ceremony but no book (in English) about the various teas drunk in Japan. Would you know about one? I just want to second the suggestion to try genmaicha, green tea with toasted rice. 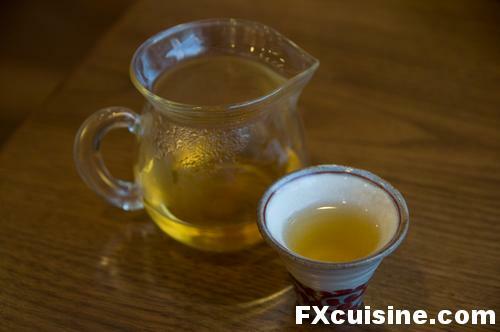 It has such a nice nutty flavor from the rice which nicely compliments the grassiness of the green tea. In fact, it's the only green tea I enjoy without sugar or honey, so I'd say it's definitely worth a try. FX's answer→ Jay, I love those toasted cereal teas they have in Japan and Korea, but don't know much about them. Just one feedback. 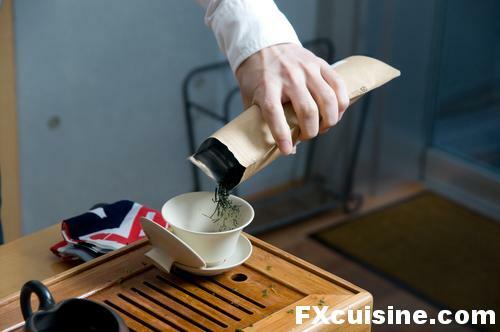 That is not a traditional way of preparing Japanese tea, but it is very close to how Chinese prepare their tea with Japanese green tea and tea utensils. And, ice is not a part of Chinese tea preperation or in Japanese tea ceremony at all (there is no frige back then). This process you described looks very fusion to me, and perhaps it is a very trendy thing to do in Japan. P.S. Love your site!!! 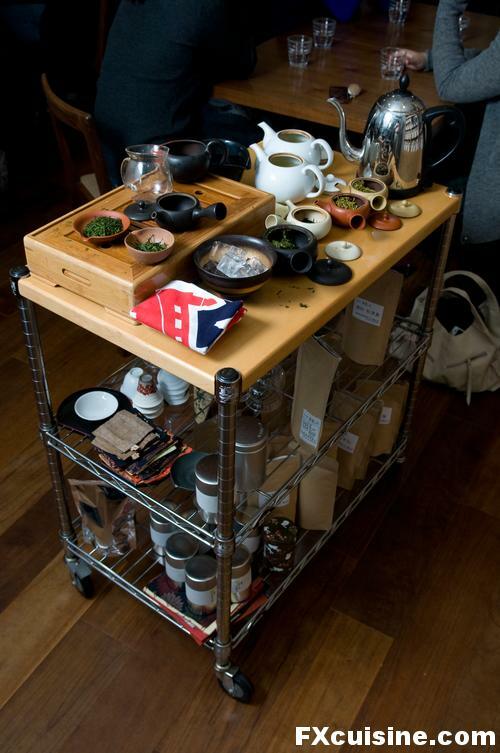 FX's answer→ Oh yes, no fridge in the tea ceremony and those tools look very similar to the ones used in China. 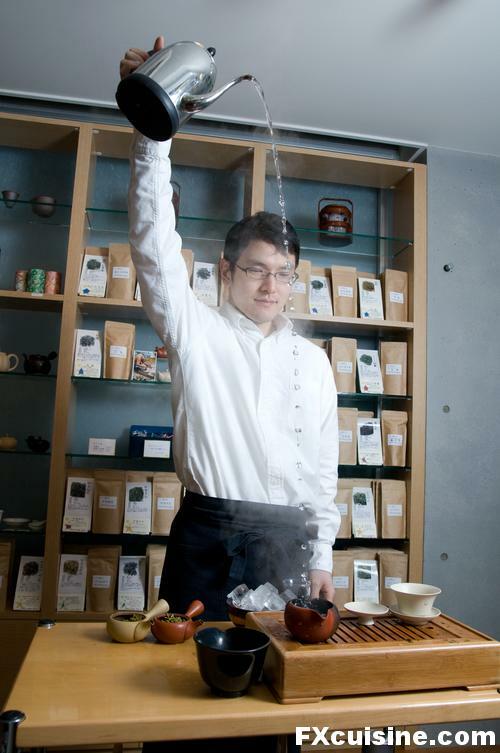 But perhaps there is more than one traditional way of preparing tea in Japan? 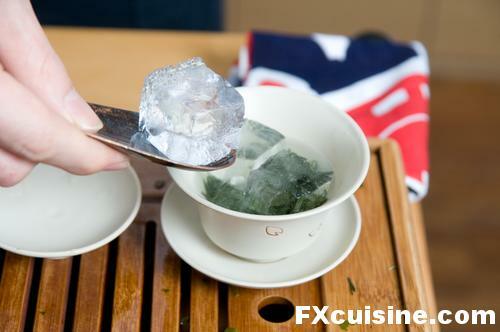 Let me add to #55: the ice method is becoming popular nowadays even among traditional tea sellers in Japan, a summer delicacy with newly picked tea (shincha) or the gyokuro type tea. The gyokuro is considered to be among the highest quality, and when prepared properly, has absolutely no bitterness at all, a full round body that rolls on your tongue with a hint of sweetness. You would never dream of adding sugar to that one. The water temperature is crucial here -- you need to bring it down to near lukewarm. Another point is stillness -- stirring only brings out the bitterness. Take that a bit further and you have the ice infusion. Cover your leaves with ice (but no hot water) and let it sit there until the ice melts. BTW I hear they grow and process Japanese green tea in the Alps. It's thrilling to imagine tea bushes somewhere among the beautiful pastures you have covered in this site. FX's answer→ Sets, thank you for this most precise background information! Gyokuro is indeed the king of the green teas, and not overly bitter. where did you read about tea being grown in the Swiss Alps? I only know of one island in Ticino where they have a tea plant surviving, but otherwise all those who tried to bring a tea plant back failed. I'd be most interested to learn otherwise if you could find me some details! Your pictures capture a beautiful art form, I can almost smell and taste the bitters of the exquisite green tea variations. You could derive a lifetime of health benefits from just going "tea tasting" a few times a week!! Thanks for the elegant tour of Japanese tea preparation! It in itself was a wonderful treat! Excellent article FX. I take it that the Japanese make an excellent tea, but perhaps not on par with the mighty Pu-Erh. FX's answer→ Gunncat, I think pu-erh (old and uncooked) are really the High Lords of the tea world, but serious Japanese green teas are extremely good, with a very different taste. Very nice article FX. 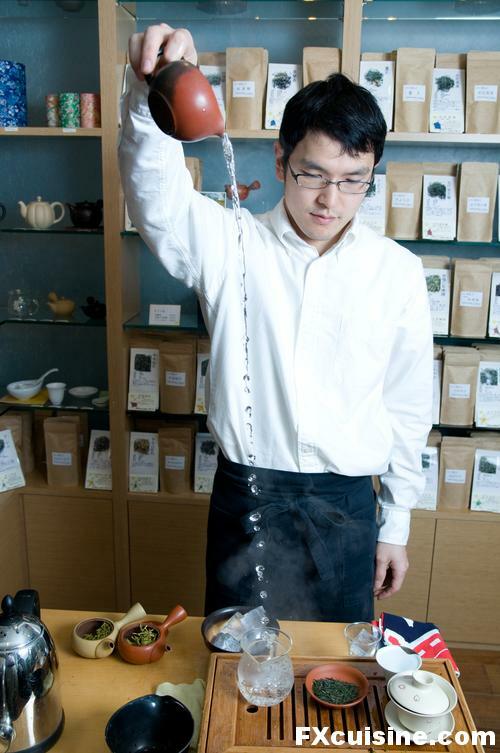 It'd be interesting if you were to make a trip to China to try some of the teas here. In some provinces and rural areas individual families grow and prepare their own teas in their farms/gardens, so there's a crazy variety of teas here. Personally my current favorite is Tiekuanyin. Have you ever tried this one? According to the lady at my usual tea shop, most Chinese tea drinkers tend to end up drinking Wulong teas or Pu Erh teas after getting starting off with green tea. FX's answer→ I'd love to be shangaied to Yunnan and visit the tea makers, I love Chinese tea and have a whole cupboard filled with teas and teaware. But I don't speak any Chinese and it is very frustrating for me to miss half of the show by not being able to speak to people directly. I did not see a post about you being nominated for best food blog! Well, I voted for you and I think you did pretty well, right? Well maybe you didn't get 30,000 votes, but you sure should have. FX's answer→ Josh, I think the poll was administered by the man who runs elections for President Mugabe in Zimbabwe, he has a thing for clear-cut results! Yes, as Oubros says, Indian tea is a variation of the milk shake, not of tea. The tea our proletariat drink is often called "khadi chamach" chai - or "standing spoon" tea, tea which has so much sugar and milk in it that a spoon you stir it with will stand without support in the liquid ( apocryphal). Tea brewed in whole milk ( I kid you not)is known in Hindi as Speshal Chai ("special" tea). Tea is also made with ginger to clear a stuffy nose or with spices such as cardamomm or cloves to warm you better in winter. Ladakh in the far North has Yak-butter tea, definitely an acquired taste That said, India is a tea-addicted country and the chattering/polite classes have legions of connosieurs of the perfectly brewed darjeeling or delicately strained-through assam from our eastern plantations, served, as we learnt from the now-packed-up-and-gone-home colonial overlords, in Royal Daulton or some similar china. FX's answer→ Well said Parshu! You really liked getting those action shots of water pouring! Now I think I have to go pee. Have you ever seen the Malaysian-style teh tarik ("pulled tea")? FX's answer→ Thanks Nate, no I have never been to Indonesia, would very much like to though! 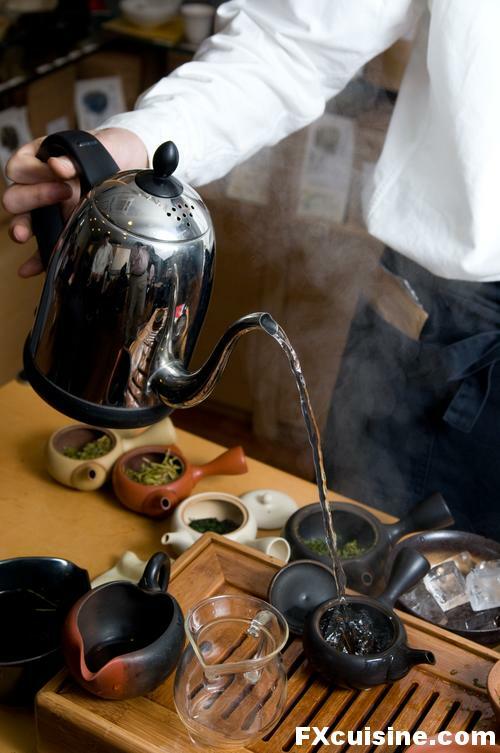 When i first arrived in Japan I could not understand and join the others in the pleasure of tea serving/drinking. After 5 years, I am a devout lover of japanese tea and the entire process and I am sure that if you insist a little bit you will convert just like i did. Great pictures. Lovely tea waiter. FX's answer→ Thanks Fabiola, glad you liked the pictures! Superbe billet vraiment bien illustré ! Merci pour l'adresse, je la garde précieusement pour mon prochain voyage à Tokyo. enjoyed reading about a tea shop in my home city here. it does look like gong-fu Chinese style tea ceremony, more than chanoyu or sencha tea..I will have to visit and try it. have you ever tasted a stem tea made of orchids? called 'crab leg tea' it is from parasitic orchid plants which grown naturally on the ancient tea trees in yunnan province. the orchids embody the essences of the tree. not purchaseable, only naturally found and harvested. I've had some which are 50 years old or so. quite an amazing flavor . wish to learn more about it. Interesting tea procedures... I do agreed with Kenko1. It's obviously to the style of Gong fu tea. I see that you knew Mdm Tseng Yu Hui of Maison de trois thés... :-) I'd been visiting her tea house since the former place. What Nate said about Pulled Tea or 'Teh Tarik' from Malaysia is quite similar to Indian style of tea/chai. Hot tea is mix with Sweetened Condensed Milk or Evaporated Milk and the mixture is pour into 2 large mugs or containers. The 2 mugs are alternately pour into one another at certain heights to allow bubbles to form and cool down the tea before serving. It's a kind of national drink in Malaysia from road side stalls to hotels as well :-D Competitions were held yearly to judge for best performance of tea pouring. Malaysia has their own tea plantation, most well known and existed since colonial time is BOH Plantation in Cameron Highlands and some local producers around the region. 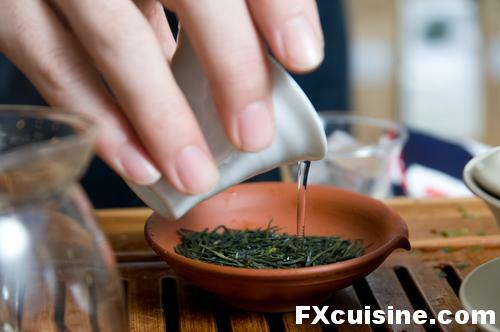 The tea mentioned by Kenko1 is Crab's Claw or Feet of Crab tea which is mixed with Green Pu Erh tea leaves. Another name for it is Unicorn Grass (not to be confused with Juncaceae or Rush, a garden plant). It grows mainly in ancient tea trees and highly regard for its medicinal properties. It's also the emblem of the Ancient Tea Tree region of Jing Mai. Just beware that some unscrupulous factories/sellers only cover the outer layer of tea disks with this orchid stems. It's better to find which is mix thoroughly inside out with the stems. 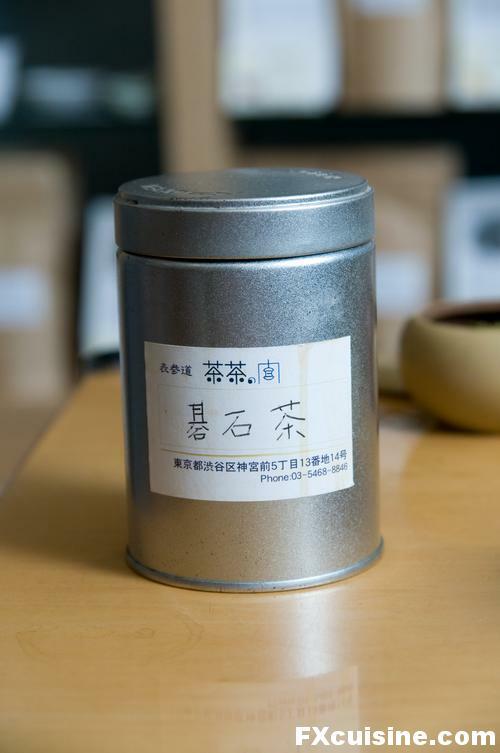 If not mistaken, some factories like Menghai produced such tea. It has a crab logo in the centre of the tea wrapper. Hope this helps... I will try to find this tea from my supplier friends. Just to say ..... You are very much missed ! New Year .... Bonne Annee, a friend in Ohio. Interesting read. I like the photos, I wish I can capture the water pouring that well. The Japanese have indeed perfected many ideas they borrowed from the Chinese, however in my humble opinion, they emphasize too much about the preparation not enough for the drinking of teas. Tout d'abord, felicitations pour vos superbes photos et vos experiences extraordinaires au Japon! Je fais partie d'une agence de voyage Japonaise et viens de decouvrir Cha Cha Noma grace a vous. J'aimerais la proposer a nos clients, cependant le site de Cha Cha Noma n'a pas de photos de cette "performance". j'aimerai vous demander l'autorisation d'utiliser une (ou deux) photos de votre experience a Cha Cha Noma, dans un de nos itineraires pour nos clients. FX's answer→ Ben si c'est toujours d'actualité faut qu'on parle de sous mais c'est possible. I was looking for best shops in Istanbul Spice Market and found your interesting blog. Too bad that there are no shops in Spice Bazar recommended in your blog. There are many cheaters; if not cheap, I want to buy good spices. I have visited Spice market in Isanbul and Dubai many times but I have never bought anything. I am going this September again and I would like to buy a lot of spices, dry fruit and nuts. I wonder if spices sold like that have any flavour left. Aren't nuts wet? I don't eat meat so I was glad to find your recepie for fish borek. I will try to make it and I intend to go to Balikci Sabahattin. I was surprised to see your pictures about making tea in Tokyo. I don't know the place. I have been living in Japan for 40 years and I learned sado (tea ceremony) so I can tell you that that is not Japanese but Chinese tea ceremony.